Today’s AM fix was USD 1,555.75, EUR 1,012.20 and GBP 1,189.59 per ounce. 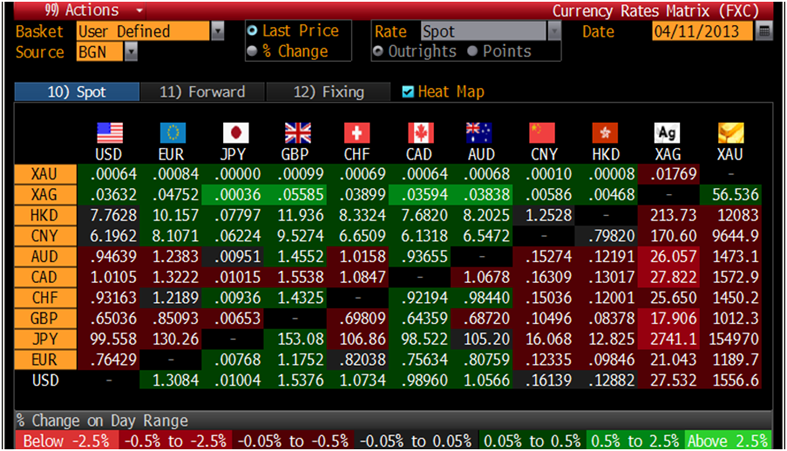 Yesterday’s AM fix was USD 1,581.50, EUR 1,207.16 and GBP 1,032.24 per ounce. Gold fell $26.20 or 1.65% yesterday to $1,558.50/oz and silver slid to $27.50 and finished -1.29%. In Europe, Cyprus has denied the plan to sell its very small gold reserves of 13.9 tonnes as a contribution to an international bailout. Were the sale to happen it would be unlikely to set a precedent for other troubled Eurozone countries as these nations now greatly value their gold reserves as important stores of value that will protect against currency devaluations. The Central Bank of Cyprus (CBC) said last night however that selling the island’s gold had not been on the table. “Such an issue has not been raised, has not been discussed and is not being discussed at the moment,” CBC spokeswoman Aliki Stylianou said. Stylianou added that sale of the gold was a matter handled exclusively by the CBC board. A spokesperson for the Central Bank of Cyprus told the Cyprus News Agency (CNA) that reports of the $523 million gold sale have not been, “raised, discussed or debated,” with the bank’s board of directors. The Central Bank of Cyprus denied the gold sale after reports on Reuters said that Cyprus officials had agreed to sell around 400 million euros in excess gold reserves to contribute to the country's bailout. Stylianou, the spokesperson for the Central Bank of Cyprus said that the gold sale was, “never discussed nor are there current or future plans to do so on the board’s agenda.” Reuters based its story on a draft report from the European Commission which assessed the nation's financing needs. News of Cyprus’ planned sale likely did not contribute to gold's weakness yesterday. The amount of gold is trifling both in dollar or euro terms versus the scale of debts in Cyprus and the wider Eurozone and in terms of tonnage. At just 13.9 tonnes the Cyprus gold reserves is equal to one week's gold demand from Chinese people. 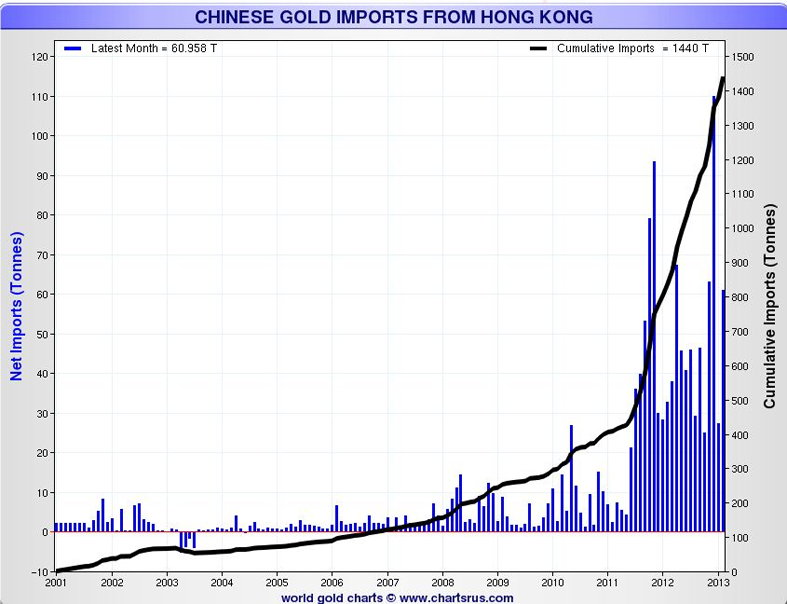 Gold imports by China from Hong Kong jumped 89% in February as lower prices led to an increased demand for gold. Chinese buyers purchased 97 metric tons of gold in January alone and the news of the demand was barely covered in the media and led to no impact on the gold price. Desperate people and nations around the world are being forced by circumstance to sell their gold while creditors are continuing to accumulate gold.